Home >> Generated from JAN's SOAR Information System on 4/21/2019 12:12:28 AM. Hydraulic reclining mechanism allows for infinite adjustments up to 180°. Composite wheels are set back to prevent tipping (rear anti-tippers standard). Arms have support extensions for reclining position while headrest extension comes with a cushioned head immobilizer for added comfort. Long-lasting, durable construction features a carbon steel frame with attractive silver vein finish, precision-sealed wheel bearings and comfortable, nylon upholstery that's lightweight and easy to clean. 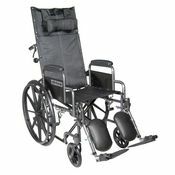 With push-to-lock wheel locks, 8” front casters, swing-away elevating legrests, plastic footplates and padded armrests. Desk arm length only. Limited Lifetime Warranty.